Alta B. 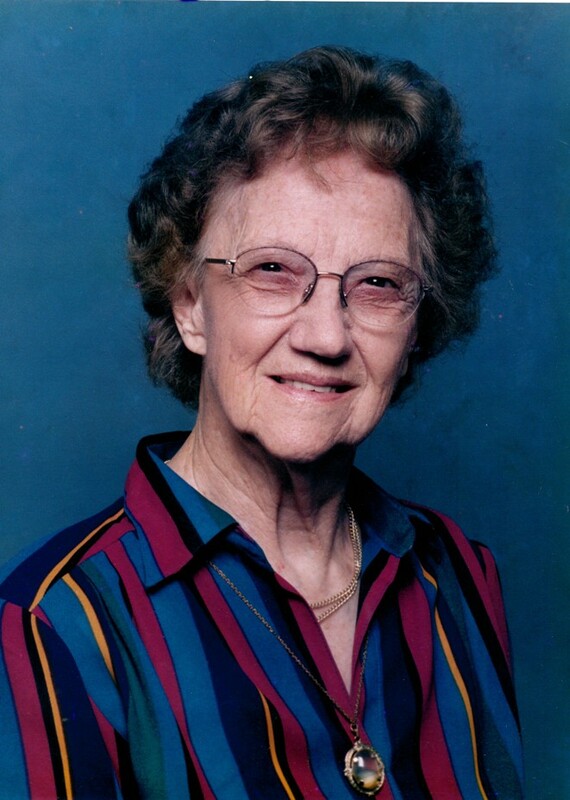 (Syth) Esler, age 99, of El Dorado Springs, Missouri, passed away peacefully at Community Springs Healthcare Center on Tuesday evening, December 8, 2015. Alta and her twin sister, Alma Bernice (Syth) Rowe, were born August 10, 1916, to William Kennedy Syth and Helen Sarah Elizabeth (Stoneburg) Syth in Sydney, MT. The family lived on a homestead in Richland County, MT. Alta married Frank Esler on October 3, 1936, at the Fort Peck Damsite. To their union was born one daughter, Isabel Alma (Esler) Dyer, currently of El Dorado Springs. They celebrated their 50th wedding anniversary in October before Frank passed away in January 1987 in Noxon, MT. They attended the United Methodist Church in Noxon for thirty-nine years, where Alta served as Sunday School Superintendent for twenty-two years. For many of those years she also headed up a Community Bible School which was held in the new public school building. Alta and Frank were deeply involved in building a new fellowship hall at the church and building the Senior Center. Preceding Alta in death were her husband, Frank; an infant daughter; her parents, William and Helen Syth; her twin sister, Alma (Syth) Rowe; four other sisters: Grace LaMont, Margie Zanders, May Allen, and Esther Mischal, of Washington and Montana; and nine brothers: Lawrence (Ted), Bernard, Kenneth, Hugh, Art, Melvin, Lyle, Verlyn, and Gerald Syth, all of Montana. Five of her brothers served in the military. Four of them survived World War II, one of them at Pearl Harbor. Survivors include her brother, Billy Duane Syth, of Post Falls, ID; her only daughter, Isabel Dyer and husband, Russell, of El Dorado Springs; grandchildren and great-grandchildren: Scott and Jane Dyer and family: Lydia, Ben, and Kathleen, of Huntsville, AL, Dr. Greg and Karen Dyer and family, Austin and Conner, of Mesquite, TX, Penny Jolene (Dyer) Greaves and husband, Mike, and daughter, Jessica Alta May Greaves, of Kingman, AZ, and Mark Dyer and daughter, Julianna Dyer, of San Francisco, CA; two great-great grandchildren, Amelia (Mia) Rose Dyer and Ronnie Craft III; and numerous nieces and nephews. Alta’s ashes will be taken to be buried in the family gravesite in Noxon, MT. Family and friends will gather there at a later date to celebrate her life in the mountains, rivers, lakes, and Big Sky that she and Frank loved so much. Arrangements were under the direction of Bland-Hackleman Funeral Home.